Roxanne Style: New Creations: Wire Wrap Jewelry! Boy what fun it is. Every piece is handmade by me. 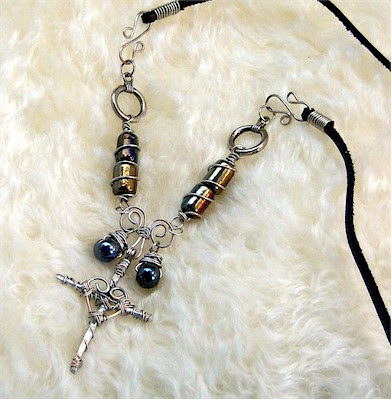 The cross is wire shaped with lead free solder inserted, the wrapped with more wire and heart shape again made from wire. The Cross alone is approximately 2 inches tall. Every element is twisted and shaped by hand. Please check out my website under "Texas Art" for more information about this piece.